Alison Mitchelson, group leader for Northern Ireland: Artists and Subjects, sought information about the artist J. Lawson. Newtownabbey Borough Council hold 34 of his paintings at Sentry Hill, but little was known about the artist. Jade King spotted John Lawson, an artist with one undated work in the Northern Ireland Civil Service Collection, which was purchased in 1988. She noticed some similarity in their signatures, and remarked that copyright officers unsuccessfully searched for copyright holders of both Lawsons. Alison Mitchelson and Osmund Bullock also commented on the similarity of signatures – however John Lawson got in touch to confirm the other works are not his. 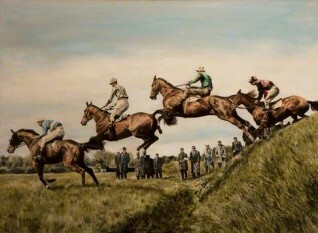 Contributors suggested various avenues, none successful, until Andrea Kollmann traced a link between the artist and Joe Dundee, the last owner of Sentry Hill, and Tim Williams suggested checking on local friends or racing circles, due to his love of horses. Trevor Lloyd responds, as he knew John Lawson as Head of Art Department, Antrim Grammar School, before he left to concentrate full-time on painting. James Martin mentioned that he is a nephew of Basil Blackshaw, a well-known artist who moved to Sweden. Bullock traces him to Finland, through his son Kristoff in Helsinki, and finally succeeds in making direct contact with John Lawson via email. He confirms that he is indeed the artist – full name John Andrew Lawson, born Belfast, 26 May 1951. Art UK amended the artist record: John A. Lawson (active 1980s) is now listed as John Andrew Lawson (b.1951).